None of them are impossible without your support and feedback. 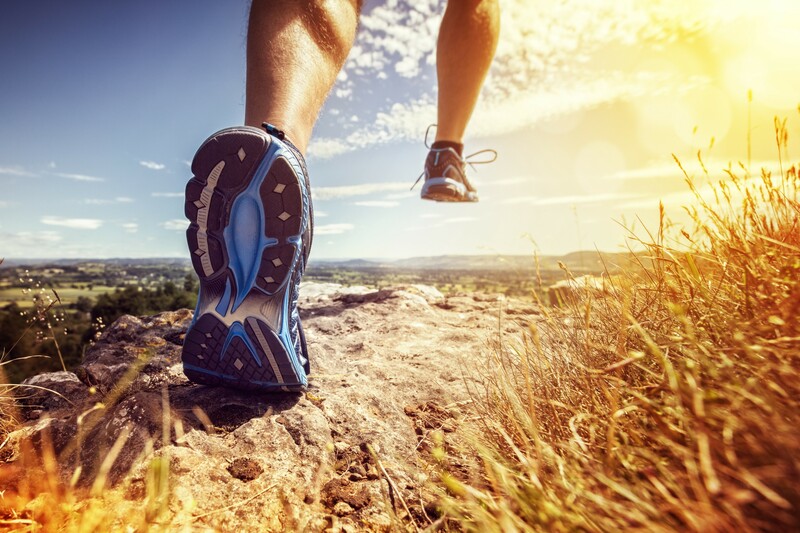 Truly shared steps are in action. As you know, previously you were able to create a test suite, add some steps to it and all of them would be inherited by test cases in this suite. From now you can create a separate shared step and attach it to the specific test case. The most valuable feature for migration from another TMS like TestRail or TestLink. We support import of test cases and suites from both of them and of course from our own format. You can submit XML, CSV, and JSON (format depends on TMS source). 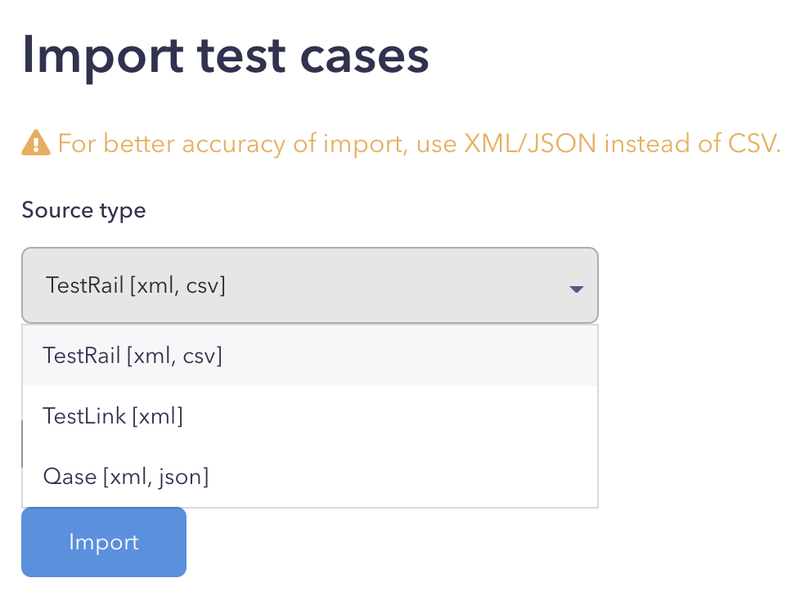 If you want to import your test case repository from TMS, that is not presented in a list, write us, and we will shortly add support for it. According to the ISTQB definition, a test plan is a document describing the scope, approach, resources, and schedule of intended test activities. 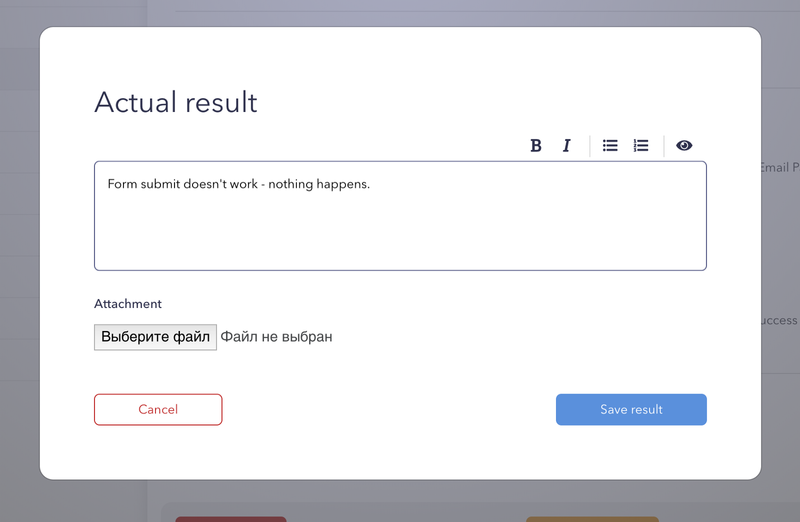 In Qase.io, you can name your test plan (e.g. Regression), describe it and choose test cases to check during the test run. The sweetest part of this post. Finally, we’ve added test runs to the application. You can find a link to the test runs page in the project navigation menu. 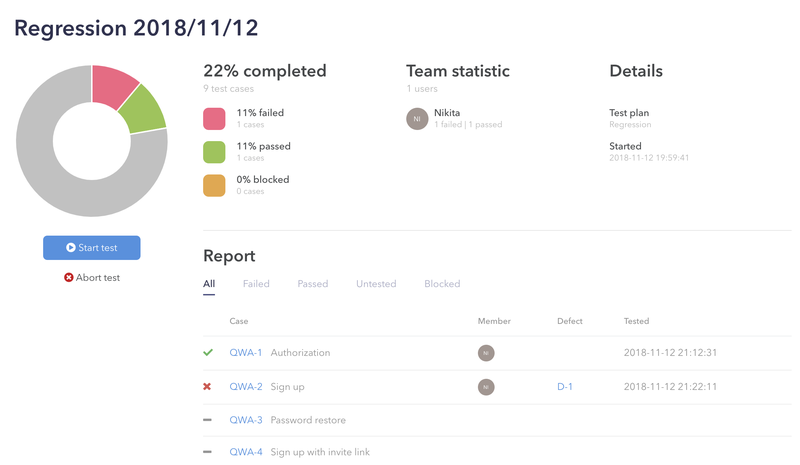 After the test run is created, you’ll see a dashboard with full statistics about this test run: completion rate, team stats, plan info, start time and end time. By clicking on “Abort test” button, test run will be closed and nobody won’t be able to make any changes in it. After submit data from this form will be used to create anew defect. For now, to start a new run, you need to create a test plan and use select it on test run creation page. Otherwise, “Start new run” button will be disabled. TMS can’t exist without a defect management system. And we’ve added a simple implementation of it. It can be created only from the test run. For now, a lifecycle of the defect is rather simple and hardcoded: Open → Resolved. Priority and severity icons moved to the left without the caption. Now row looks more compact. Added background for suite header. It helped to split suites from each other. Removed edit/delete buttons for test cases. Test case preview feature. By clicking on a test case, you’ll see a short preview of it. If you want us to add some feature or change some behavior in the application, contact us by email or use messenger in the app. You can open it clicking on chat icon (🗨️) in the left sidebar. 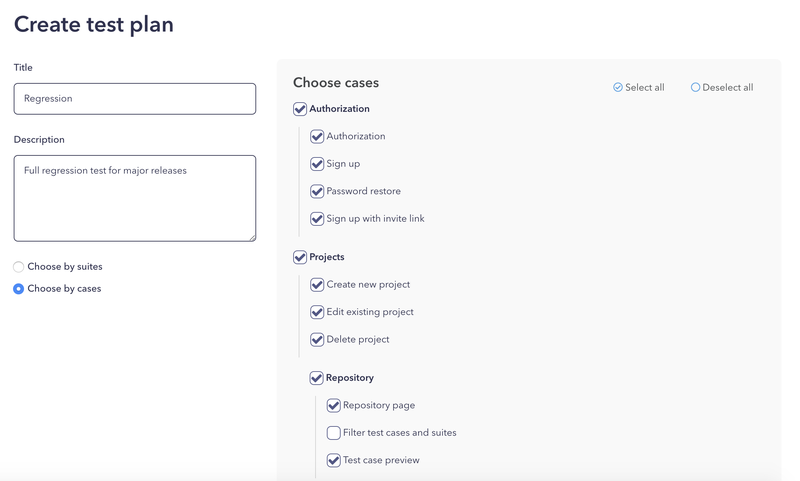 The second most valuable and most requested feature: integration with Jira Server and Jira Cloud. Qase.io is in active development and some features are done fast to get fast feedback from you. So some of them require facelifting after release. Current UI is not final and it evolves with the application. We have several really cool ideas in our backlog, that you’ve never seen in other TMSs. Subscribe to this blog, our facebook page, twitter account, and telegram channel to get notified about next update.